We are excited to share some important news about University of Washington Recreation, formerly known as University of Washington Recreational Sports Programs. Updating the department’s name is just the first step of aligning with its mission to provide safe, accessible, and dynamic recreation experiences. The unit’s new name, UW Recreation, represents all the vibrancy, dynamism and engagement it has to offer: whether paddling sea kayaks on a UWild Adventures trip, dancing their hearts out in a Zumba class, scoring the winning goal for an Intramural soccer team, or reaching their personal health and wellness goals – members of the UW community can access incredible opportunities through UW Recreation that cannot be contained within a narrow definition. The timeline for rolling out the unit’s rebranding efforts to the greater campus community begins now – and it begins with you! This summer, UW Recreation is updating materials both on and offline and notifying campus and community partners. In the fall, it will officially announce the new department name to the broader UW community and the general public through orientation events, digital/print communications and other channels. When you share information about the department, please do so by referring to it as University of Washington Recreation, UW Recreation, or just Recreation. If asked why, feel free to refer to the updated mission statement below. Better yet, share your favorite Recreation experience, whatever it may be! As partners in UW Recreation’s pursuit to engage students in growth and wellbeing, we need your help for this change to take hold. 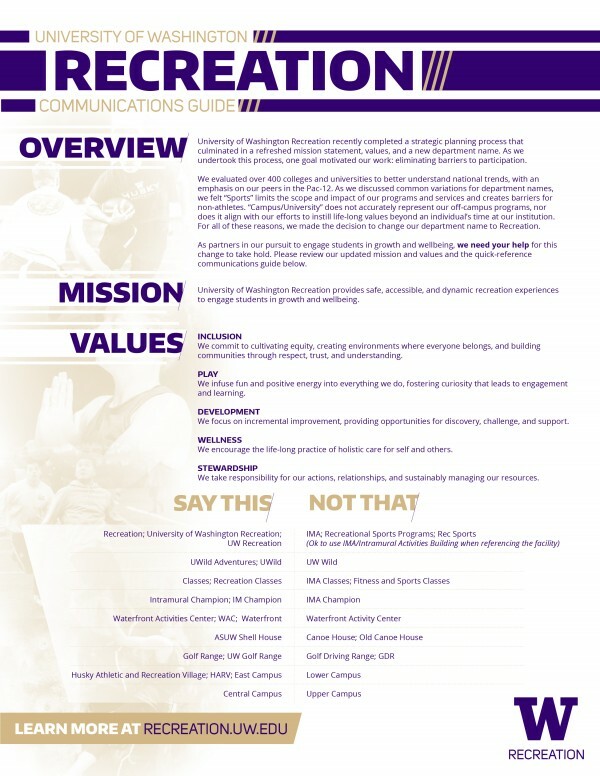 Please review the document below with UW Recreation’s updated mission and values and a quick-reference “Say This, Not That” communications guide. If you have questions or would like more information, please don’t hesitate to reach out to Adam Serafin, Associate Director for Communications and Development for UW Recreation.